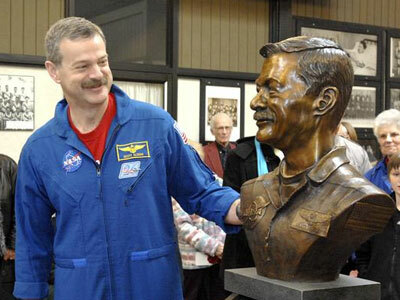 The Tazewell County Museum and Educational Center located in the Sunset Shopping Plaza in Pekin, Illinois revealed Sunday a bust of astronaut Scott Altman (STS-90, STS-106, STS-109, STS-125) by local artist Morgan Elser. 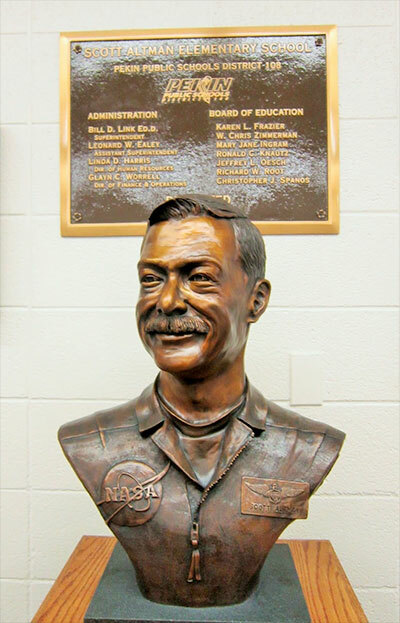 According to the Pekin Daily Times, the bust will accent a special exhibit on space exploration and Altman's career that fills one room at the museum. The exhibit incorporates several items donated by NASA, including the nose cone of a booster rocket from Altman's last trip into space. Local NBC-affiliate WEEK News 25 spoke to Altman and Elser at the unveiling. Scott Altman says he couldn't have achieved everything without the three most important things in his life: God, family and an F-14 plane. Morgan Elser engraved all those symbols and more into the statue, capturing Altman's personality in every detail. "I just saw that he was a warm person, a very genuine person, and I also noticed that he had a little bit of a grin and he had really, really laughing eyes, so I wanted to capture that," says the artist, Morgan Elser. "I do think it's more of a symbol than 'me.' So many people worked so hard to give me the tools that I've needed to get to different places in my career, and it hasn't been me alone. It's been leaning on that base of support. So, now it's kind of an achievement for the community, Central Illinois, and I hope people can be proud of that." The bust not only immortalizes the Pekin native's achievements, but also his characteristics, both mental and physical. Alman laughs when we tell him; "Your mustache is immortalized now." "I guess it's a good thing I never decided to shave it off," says Altman. "I guess they're not quite in vogue as they used to be, but it's me, so I gotta go with it." I have seen the bust of Scott Altman in person and it is a very nice tribute to a wonderful person!!! Very nicely done!!! The bronze bust has been moved to Scott Altman Primary School in Pekin, Illinois for three years as the Tazewell County Museum raises funds to build a new facility, the Pekin Times reports.